Born in 1870, George Lewis “Tex” Rickard’s career path was far from traditional. He served time as a Texas marshal, prospected for gold in Alaska, founded both the South America Land and Cattle Company and the Rickard Texas Oil Company, and famously promoted boxing across the United States. But according to Chad S. Seifried and Ari de Wilde in their article “Building the Garden and Making Arena Sports Big Time: ‘Tex’ Rickard and His Legacy in Sport Marketing” from the Journal of Macromarketing, Rickard also made important contributions to the field of sports marketing decades before it was thought to exist. Foreshadowing the beginning of the Great Depression, George “Tex” Rickard succumbed to appendicitis in 1929. 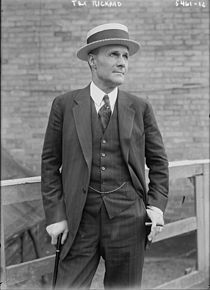 A leader and representative of sport marketing during the 1920s, Rickard altered the urban landscape in American cities by definitively showing that promoters could use sports in arenas (i.e., indoor) to help those venues be economically viable through the production of awe-inspiring spectacles. In this article, the authors critically examine sport marketing as a tool to help reframe the career of Tex Rickard and ultimately the development of Madison Square Garden III in the context of macromarketing. This historical and illustrative case study will also demonstrate that sport marketing is somewhat different than traditional marketing through an emphasis on media and community relations. Finally, we will show how Rickard made use of the traditional “marketing mix” (i.e., place, price, promotion, and product) to capitalize on the urban setting and other strategies employed to promote products and services. You can read “Building the Garden and Making Arena Sports Big Time: ‘Tex’ Rickard and His Legacy in Sport Marketing” from Journal of Macromarketing for free by clicking here. Want to know about all the latest research like this? Click here to sign up for e-alerts from Journal of Macromarketing! This entry was posted in Careers, Cultural Research, Entrepreneurship, Macromarketing, Marketing, Media, Social Impact, Strategy and tagged macromarketing, marketing mix, public relations, sport history, sports marketing, Tex Rickard by Cynthia Nalevanko, Senior Editor, SAGE Publishing. Bookmark the permalink.